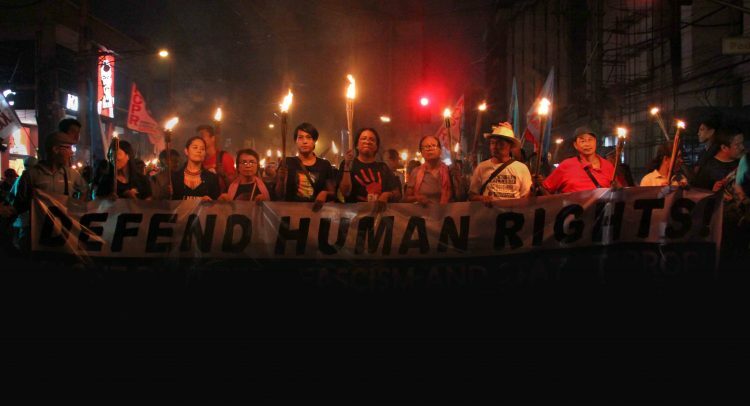 The National Council of Churches in the Philippines, in reaffirming its previous support for initiatives to enact legislation that aims to strengthen the cause of the protection of human rights and human rights defenders, reiterates its support for House Bill 1617 – the Human Rights Defenders’ Protection Act of 2016. The NCCP also expresses its support for House Bill 8128 – the Human Rights Defenders Protection Act of 2018. These efforts by our concerned lawmakers are relevant especially when human rights are constantly under attack. The protection of life and human dignity is among the NCCP’s ultimate and enduring ecumenical concerns. To defend the welfare of God’s people in pursuit of an abundant life as Christ has promised (John 10:10) is a faith imperative. Thus, the defense of human rights is part of our Christian witness and mission. Asserting that “humans are created in the image of God (Genesis 1:26),” the NCCP has consistently stood for human rights and has worked with human rights defenders to protect God’s gift of human dignity. The NCCP uses its prophetic voice in advocating in the national and international arena of the need to uphold human rights in the country through seminars, fora, conferences, and lobbying. Even the council’s former general secretary, Bishop La Verne D. Mercado, who was a staunch human rights advocate during the Marcos dictatorship, was persecuted as a rights defender when state agents illegally arrested him for being a religious mouthpiece against state abuses. Given the current state of human rights in the country, there is a greater need to adopt urgent measures in protecting human rights defenders; exert greater effort in human rights education; fine-tune institutional policies and guidelines of government offices, especially state forces; strictly adhere to human rights laws; and institutionalize the protection of human rights defenders. We echo this message because even churches today face the same persecution, harassment, and vilification. The attacks on our member churches, including the recent equating of the works of the Iglesia Filipina Independiente (IFI) and the United Church of Christ in the Philippines (UCCP) to terrorism, are condemnable. As a staunch advocate of the rights of the Moro and Lumad, The Rt. Rev. Antonio Ablon of the IFI is facing the same harassment because he chose to side with the oppressed national minorities in Mindanao and with the defense of human rights in general. A wife of a UCCP pastor, Rachel Mariano, who is currently detained for trumped-up charges, should immediately be exonerated. The family of the likes of Elisa Badayos, slain in a fact-finding mission in Negros, should be given justice. Many more human rights defenders who should be carrying out their work to be in solidarity with victims of rights abuses will find shelter in legislation and bills that promote the protection of human dignity and lives of many Filipino people. We stand in the belief that these injustices should not be experienced by church people and institutions as they perform their witness and ministry. The culture of impunity persists in our country. Many of those who engage in extrajudicial killings, forced disappearances, torture, and other grave human rights abuses are not investigated nor brought before the bar of legal justice. Worse, some of them are even promoted. None of the extrajudicial killings that occurred under past administrations have been addressed, despite sound legal battles. By contrast, we have witnessed continued incidents of gross human rights violations, including extrajudicial killings, and a continued perpetuation of the culture of impunity. Our clarion call to the government to end impunity is clear and continues to ring true with utmost urgency. Thus, the NCCP reiterates its support for House Bill No. 1617 or the Human Rights Defenders’ Protection Act of 2016, which we deem very timely. The NCCP also expresses support for House Bill No. 8128 or the Human Rights Defenders Act of 2018. These bills are designed to address the protection of human rights defenders against any form of state violence or harassment that may be inflicted upon them. The bills respect the divine image within every person and protect the human dignity that is conferred by being created in the image of God.